Pope Francis is once again using Holy Thursday to highlight the Gospel mandate to visit individuals in prison. “At times, a certain hypocrisy pushes us to see prisoners only as people who have messed up, for whom the only path is prison. But we have the possibility to make mistakes,” he said in an interview published on April 13 by Italy’s La Repubblica newspaper. Francis has made a point of visiting prisoners during his pontificate, including during his 2015 visit to the United States when he spoke to inmates at a Philadelphia corrections center. He told La Repubblica that he was inspired by the late Cardinal Agostino Casaroli, a Vatican secretary of state who regularly visited a Roman prison anonymously. It is the third Holy Thursday that Francis has spent at a detention center, part of his longstanding emphasis on ministering to prisoners and giving them rehabilitation and hope. “Every Saturday evening he would disappear: ‘He’s resting,’ they would say. He would take the bus, with his work briefcase, and would stay to confess young people and play with them. They called him ‘Don Agostino’; they didn’t really know who he was,” Francis said, according to a translation fromVatican Radio. As he did in an interview published on the night before Ash Wednesday, Francis suggested individuals look at their own lives before judging others. He said human beings construct their own prisons when they idolize economic systems that oppress other people. “When we remain closed in our own prejudices, when we are slaves to idols of a false well-being, when we move within ideological frames or when we absolutize economic laws which crush people, in reality we are doing nothing other than remaining within the cramped cell walls of individualism and self-sufficiency, deprived of truth which generates freedom,” he said. “And to point the finger against someone who has messed up cannot become an alibi for hiding one’s own contradictions,” he continued. Francis also denounced warfare, calling on the world to “stop the lords of war, because those who suffer most are the last and the helpless” and condemning an eye-for-an-eye mentality. Pope Francis at Chrism Mass: find joy in the "little things." 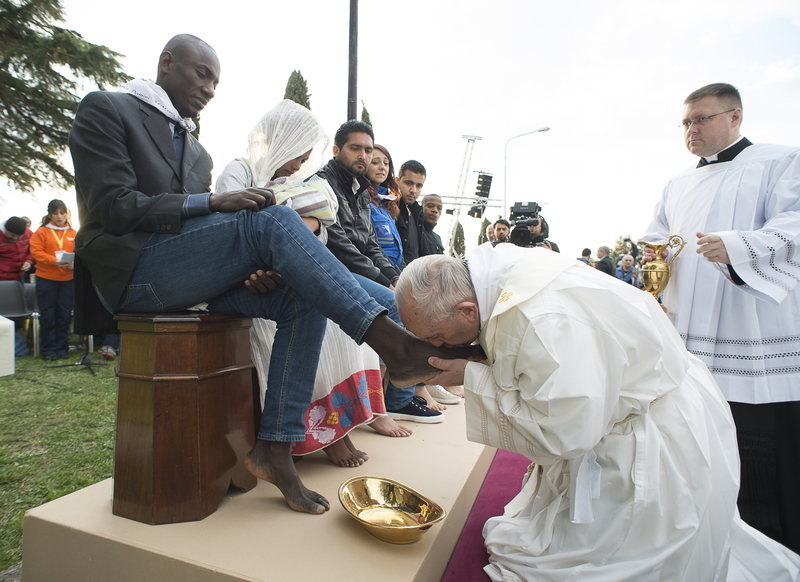 Francis will wash the feet of 12 prisoners on April 13, in commemoration of Jesus washing the feet of his followers. The pope will continue his tradition of including women and Muslims in the ceremony. The Vatican said two of the 12 inmates chosen for the feet-washing ceremony are serving life terms, while the others have release dates between 2019 and 2073. "They adore this pope and are looking for a word of comfort for themselves and their families," prison chaplain the Rev. Luigi Paoletti told Vatican Radio. Because of the nature of the prison and its inmates, Francis' visit is being conducted under unusually private terms: The Vatican said audio and selected television images of his homily would be released only after the fact. Usually, the pope's activities are covered live by Vatican TV and radio. Paliano's 60 to 70 inmates include about 50 former members of organized crime in Italy who became government witnesses. The prison also houses four women and has a special ward for tuberculosis-infected inmates.